If the construction contract for the Mistral signalled the beginning of Festival Cruises, then her confirmation as main contender for the European cruise scene was on 27 July 1998, when a contract for the construction of two sister ships to the Mistral was signed with Chantiers de l'Atlantique. In December that year the contract was confirmed. In October 1999, Festival Cruises decided to increase the length of these new vessels to 35 meters, increasing the maximum capacity from 1,670 to 2,035 passengers. On 20th. June 2000 the keel of the European Vision was laid. In that ceremony, Mr. Poulides pronounced "Global style means American style" a now famous phrase. On 11 May 2000, all the maritime press announced the purchase of Festival Cruises by British owner P&O, for $400 millions, payment in cash and P&O-Princess shares. Festival Cruises would keep her autonomy as a separate branch in the P&O-Princess stable. Only three months later, the agreement was broken. In theory, a disagreement over the value of those shares was the cause of the rupture. In January 2001, Festival Cruises appointed Tim Harris, a former P&O executive, to define the strategies that would drive it be the leading owner in cruise shipping in the Old Continent. The two European twin vessels are, in theory, the transition toward a pair of panamax cruise ships, with 1,250 cabins and 2,500 passengers capacity, they would constitute the Festival spearhead in the 21st. century. But, in a recent interview in Lloyd's List (6 July 2001), Georges Poulides declared that these options would not be converted to a firm contract until, at least, the later months of 2002. This fact means that these ships will not be delivered to Chantiers de l'Atlantique before 2004 or 2005. He also announced the creation of a new enterprise holding, Festival Properties, located in Luxembourg, that will control all Festival Cruise ships. At present Festival Cruises has a 30% increase in passengers more than in 2000. But the future of Festival Cruises is now to consolidate in the cruising sector of the market, which started in the later years of the 1980's. The result has been the creation of four large cruise ship owner groups, whose business volume covers almost 60% of the market. Festival Cruises has invested almost one thousand millions Euros in three cruise ships, and needs to invest another E 1,000 at least to be able to have a competitive fleet in the European market. The growth of Costa in next four years, which will double the capacity of her fleet until 20,000 pax, has obliged Festival Cruises to place new investments in cruise ships as well as having three old cruise ships purchased in the second hand market that soon will not be competitive due to technical problems (high fuel consumption, air contamination, etc.) as well as accommodation difficulties (small cabins, cabins without balcony, etc). So it was believed that the Festival Cruises growth process, both fleet renewal and pure increment, could be only financed if the company found an external investor. This can have two origins: one of the "Four Big" owners. Carnival already owns Costa. RCCL has been financed strongly by Europe with the alliance with First Choice, Escape Cruises, that will start to operate next year with her first cruise ship, Island Escape. Her big debts convert this into an improbable option. The Star Cruises group is the leader in Asia and is always thinking of the USA market financing very strongly NCL. Europe is her 'Achilles' heel' but Star Cruises is now badly in debt. Besides, Star Cruises would to have absolute control over Festival Cruises and Poulides has already made his intention clear to keep control after any hypothetical merger. There remains P&O-Princess, which was intended in the year 2000, and which I consider to be the principal candidate. With her branches of P&O Cruises and Aida-Seetours, P&O-Princess is already the leader in Great Britain and Germany, but in the markets of the south of Europe the presence of P&O is laughable. Besides, P&O always wanted to keep intact the culture of P&O Princess after merger. I believe that they will return to negotiate in the near future. The second option is a merger between equals. In this hypothesis, I have a clear candidate: MSC. The two new ships of MSC are clearly identical to the European Vision. This would allow both fleets to share a technical base with a reduction in maintenance costs, better crew rotation etc. European Vision was contracted originally as a sister of the Mistral. The management of this ship soon demonstrated that the principles of the Mr. Poulides, at least in cruise ship size, were mistaken: Mistral is a little ship, expensive to operate, and with high mileage and passenger costs compared with contemporary cruise ships that were competing. Due to this fact, Festival announced, on 8 October 1999, the decision to increase by 35 meters the length of her two new constructions thus increasing the number of cabins from 625 to 750. This is the most important difference between Mistral and European Vision. On 22nd June 2001, the European Vision was delivered in St. Nazaire, with little. The French, the Greek and European flags were occupying a pre-eminent place, but the European Vision flies the Italian flag at her stern, and she was registered in Genoa. Different to Mistral which has French registry. European Vision was launched by Mania Poulides, the wife of the president of the company. At that ceremony Mr. Poulides spotlighted what "was a very important day for Festival", and "with European Vision we were underscoring the position of being the best European cruise ship owner, that is to say the best company in the most exciting market of the world". Mr. Poulides also said that "there doesn't exist over capacity in the European market" and "European Vision is a ship specifically designed for the European market and has been designed and constructed by an European yard, and flies an European flag". The christening ceremonies were belatedly held in three ports: Barcelona, Genoa and Marseilles. European Vision sailed on the first commercial cruise from Marseilles on 30 June 2001. 1. Increase of size respect to the Mistral. When Mistral was built, Festival utilised the argument of the human size of a cruise ship to justify the singularity of her size. Evidently, these romantic considerations have little logic today in the cruise market (except in the marketing side). This additional size permit the creation of an outdoor restaurant on deck 11, forward of the buffet, the installation of a conference centre and more sports installations, as well as an additional lift tower. 2. Following the path of the Mistral, all the cabins on board, both outside and inside (except the suites with a balcony), have the same surface. Moreover, all the cabins are in the superstructure, away from the sources of noise and vibrations. 3. European Vision is the first Festival ship featuring Mermaid azimuth propellers. One of the consequences is a low noise and vibration level in cabins, even with the thrusters in use. European Vision also utilises the IGBT converter technology. This gives a saving of 12% in weight and size, plus a better output and economy over a conventional diesel electric installation. Also, certain other enhancements have taken place: increased air conditioning capacity, increased water production and upgraded bow thrusters. The European Vision, like Mistral, has eight decks dedicated to passengers, all christened with the names of European capitals. The architectural design of the European Vision, as well as the remainder of the Festival fleet (including Mistral) corresponds to the Greek firm AMK Architects & Designers, which has, in the last few years, been a most important reference point, despite some spaces in the Celebrity fleet. Her style is reflected in the use of timber, or of materials that imitate timber in 90% of the areas that have been decorated on board. To give a contemporary touch, in certain zones (mainly in the ceilings) modern materials, such as stainless steel, brilliant brass, copper and lithographs over plastic have been used. The predominant colour on board is blue, with garnet and red as secondary options. The result is a very coherent decoration (everyone notices this coherency), without strident clashes of colour. But she also has some disappointing features, such as the restaurants, which don't have the size nor the wealth of decoration found on other contemporary ships of rival owners (Costa Atlantica or Costa Victoria). The salons and spacious public areas in European Vision occupy 16,000 square metres (a 60% increment over the 10,500 square metres of the Mistral). I believe that the result is a warm, pleasant European atmosphere that is not offensive, and very adequate for a ship destined for people of moderate budget who are considering a cruise. The finished level of the ship is excellent not like that of a just delivered vessel. The layout of the public spaces is almost identical to the Mistral. Beginning in the lower deck for passenger use, Oxford (5) was found amidships of the Marco Polo restaurant, forward of the main galley, which was located aft of this deck. It has 610 seating spaces (double seats), only 30 more than Mistral, and does not look bigger. So, the distance between tables is, in some areas, narrow, and the waiters have difficulties in serving. 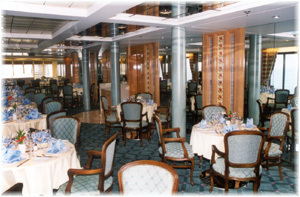 The Marco Polo restaurant features tables for 2, 4, 6 and 8 people seated in chairs and sofas (broadsides). The restaurant has an "O" shape around the funnel casing, with two forward sections that could become independent to form private dining rooms. It has only one level, different to the Mistral where the zone around the funnel had been raised to improve the view. This space makes use of the complete beam of the ship, with enormous portholes on both sides (a Costa influence), and a garnet decoration between them (beige and cream stripes in Mistral). The central bulkheads are covered by mirrors, to give a sensation of height. The ceiling is modular (the same is found on Mistral) with lamps imitating gondolas, and indirect lighting in the sides, from behind the curtain. The existing lamps in the sides of the dining room imitate torch lights, with a red lamp and a ventilator that lifts a red veil. The effect, when dining, is a very warm ambience. The great problem is the level of noise and vibrations, due to the lack of absorbent surfaces (all surfaces are metallic or plastic, mirrors etc. ), and a lot of pillars. The disposition of waiter stations doesn't work well, and results in a lot of waiter movements in the passageways linking galley and dinning room. This complicates circulation. The decoration is certainly plain, compared with of the main restaurants of the competition (Tiziano of the Costa Atlantica), though never offensive. The curled forward access areas are decorated in marble and with splendid shelves that show the wines and gastronomic excellencies that can be taste here. Forward of the Marco Polo restaurant is found on the starboard side, the Regent Street commercial gallery, larger that on Mistral, though decorated with the same criteria: a pyramid shaped ceiling of stainless steel, frames of the shop windows also make in stainless steel, blue carpeting, etc. It is interesting to see that Festival Cruises differ from the last cruise ships delivered (Millennium, Costa Atlantica, etc.) which concentrate all their shops in only one area (generally in the entrance to the theatre), has opted to disperse hers in three different locations: two in the exit of the restaurants, and a third near the atrium. Personally I think that this works better than one commercial zone. Opposite the stores, on the port side, is Chez Georges, a lounge that carries the name of the president of the company. On European Vision there is also a Georges Poulides portrait. This "megalomaniac" detail is typical of the Greek owners (the Michael's Club of Celebrity must be named to Michael Chandris). It is a locality that has a double use: a meeting point before dinner (like the Rendez Vous Lounge on Celebrity ships) and a live music lounge in the evening, with tropical music such salsa and merengue. It has a radial layout, whose centre is the marble dance floor, and is decorated in violet tones. There is a little bar forward on the port side, and the whole area is comfortable and intimate. Forward of the central stair tower is the reception area (Picadilly Reception Desk), decorated in blue and with two desks (forward and aft). The forward one houses the classic purser's deck, and the opposite counter acts as the shore tour office, the bank, etc. This extra counter is a novelty with respect to the Mistral. On the port side of the Reception Area is found a large Internet Café, another novelty in a Festival fleet, with tables of different types (high, low, etc). Also, this is an open area, an implicit invitation to use the service, a lay out also used in another cruise ship delivered this year, the Costa Tropicale. Starboard is found another commercial zone, also open, and without separation from the circulation pattern. This houses de luxe stores such as Gucci. I think that this is very interesting, this integration of the boutiques in a great open space such as the reception hall with plenty of height. The forward zone of the reception is very similar (or identical), to the same space of the Mistral: a two deck atrium, with a marble fountain forward, a star in the marble floor, and a circular shaped roof, etc. This space is designed as a meeting point, and works very well. Also, this is the first image of the ship that the passenger has upon embarking, and because it is situated in the lower deck for passenger use, it also improves the layout on board. Furthermore, all the cabins are up from the reception desk. The atrium size is smaller than the atriums of the Carnival, RCCL or other Costa ships; this gives it an intimate aspect. I believe that European prefers this magnitude rather than the mega atriums type Costa Atlantica. Forward of this deck is located the Gondola theatre, which together with the atrium gives the only two decks high space on board and has a capacity of over 800 seats. The arrangement is identical to the Mistral, with two glass entrances on both sides, but the slope of the balcony tier and the sides has provided popular spaces. Starboard is located the Ambassador Cigar Room, fitted with large sofas, a faux fireplace, etc. Port is located the White Lion Pub, a local of English inspiration that is mainly decorated in wood. There is a round bar between both areas, underneath the theatre. Both spaces have a clear day use. This allows passengers to use the theatre bar during the day, but if the bar were inside then it would not be used in the day time. The theatre has a tiered seating disposition (without balcony), and completely pillar free, with splendid views from any seat. The decoration is similar to the Mistral, with ochre lateral bulkheads, and a roof of imitation copper, while the carpet and upholstery is violet. The illumination is spectacular: the ceiling has multiple filaments of fiber optics, while the lateral bulkheads, contoured in vertical stripes to improve the acoustics, has indirect lighting. Sofas, chairs with wheels and little glass-topped tables constitute the furnishings. The semicircular stage is generous in size and has an orchestra pit. Aft of deck 5, or boat deck, is located the Pergola restaurant, of 296 seat of capacity. This restaurant is reserved for passengers of suites with a balcony, though other passengers can use it with a reservation and after paying a supplement. This fact means that the ship operates with two classes, and supposedly a novelty in the cruise market, which usually allows freedom in dining options. It has a "U" shape, with an outdoor section sheltered from winds and rain with a canvas screen allowing passengers to dine outside. The decoration is in green tones (both tapestry and upholstery), more classical than in Mistral, but with simple patterns that make it very pleasant. Inside aft the windows are full height, and allow passengers to see the wake of the ship. The menus are designed and inspected by seven European chefs of different countries, all members of the Bocuse d'Oro association. After crossing over the aft stairs, the passengers find two circulation routes. Port is the San Marco Shopping Area, a zone dedicated to stores of jewellery, craftsmanship, etc. It was the best decorated area of the three on board, while starboard was found the photo gallery, conveniently located on the route of the passengers who have balcony suites, but out of the restaurant-theatre circulation of the other passengers. The disposition and decoration is very similar as in the same space of the Mistral, with wooden shelves that convert it into an art gallery when the concessionaire closes the service. Both spaces are well decorated and illuminated. Already, in this zone, the superstructure, due to the arrangement of lifeboats, doesn't take all the ship's breadth. Because of this, from this point forward there is only a starboard inside passageway, through which the passengers can get access to all saloons. But the passengers can also use the promenade deck under the lifeboats. The central part of the ceiling has a big crystal chandelier with glass of various colours that gives it a splendid appearance when illuminated. It seems like a sculpture anchored on the low stainless steel roof! Also, it is the most expensive piece on board ($40,000). The lighting is very pleasing, and adds intimacy to the area. It has a bar forward, while the piano, surrounded with a perimeter table and sofa, is to starboard. Maybe it is slightly far from the Pergola restaurant to serve as meeting point before dinner. The Lido Casino is located port, out of passenger circulation. So, you must go looking for it. This is quite a difference to the last ships, mainly dedicated to the American market, where the passageways cross the casino, and the passengers cannot avoid it. This is also the case in the Millennium, Costa Atlantica, etc. Nevertheless this is a pleasing detail, the casino is much larger than that of Mistral, though smaller for the American market cruise ships. This room is decorated in blue tones, with a metallic ceiling, and a bar aft, also with slot machines. The decoration includes a Harley Davidson in the entrance, which is advertised to be a prize in a raffle. European Vision is very well prepared for conventions, incentive trips, etc. The Festival Business Center is a novelty for Festival Cruises. It houses a fully equipped business centre which has the latest technical facilities for business activities (video conferencing, internet connection, video, fax, simultaneous translation, etc), with a principal hall which can accommodate 125 people, and two smaller halls, separated by sliding partitions, for 49 and 12 people, respectively. The ship has a crew dedicated specifically to these duties. Maybe this is one of the reasons of the G-8 charter. The principal theatre also can be used for these uses. Forward is found Caffé San Marco, an intimate café. The design encircles the upper level of the atrium, between glasses with Venetian images. This is a popular spot for coffee and drinks throughout the day. The bar is port aft, with plenty of mirrors; this is a weak point in the decoration. This is also a meeting point to enter the upper level of the Gondola theatre, which has a conventional access. On this deck, on both sides of the superstructure, is located the promenade deck, under the lifeboats. It hasn't any attractiveness: it is decked with astroturf, without chairs, etc. Many passengers will only come here for the boat drill. Each evening there is a second show in the Amadeus Show Lounge, located forward on deck 7, on top of the theatre. This space has a double use. The main use is nocturnal, as a night club, with a circular dance floor of white and black marble, and live music to prolong the entertainment after the end of the theatre performance. The decoration is more discreet that the on the Mistral's (that imitating the zebra'skin), mainly in grey and maroon tones. There is a bar on the port side. In day time, the main use is as a Card Room, located starboard with an open plan, and decorated in English style, this gives it a quiet and calm atmosphere, far from the nocturnal hyperactivity. The main problem is the lack of acoustic isolation from the theatre, and from the cabins located above it, on deck 8. This area would be better located on a lower deck, inside the hull, similar to Salon Coral on the Costa Atlantica. The day activity is concentrated over all on deck 11 and 12. Aft deck 11 (Cannes) is situated La Brasserie Cafeteria, a "U" shaped buffet around the funnel casing, with a 288 seat capacity. It has two buffet lines (port and starboard), and is decorated in green tones. The passageways are of marble, as are the tables. This area permits magnificent views over the wake of the ship. The only problems are the drink stations, situated too far aft and also very noisy. There are automatic doors forward, toward the pools, but not aft, due to the lack of an exterior section here. Furthermore, in my opinion, the buffet is small for a ship of this size. The open sun deck area is divided into two parts, because the central stair reaches this deck, and the staircase divides the lido deck forming a wall, and this separates food and pool area. The roof of this wall can be used as a stage for an orchestra. Aft is located Chez Claude Grill, which compensates for the lack of an outdoor part to the buffet and basically expands the dinning time to 24 hours. It also has counters both sides, port for pizzas and starboard for grill fare. Forward of the buffet there is a wood decorated bar, fitted with an ample serving hatch, very well used by the thirsty bathers. There is forward an ample supply of tables, protected by a canvas. All the furnishings are made of plastic, and the roof is made in astroturf. It's very well sheltered from the wind, which is supposed to be a great advantage with respect to the Mistral. Forward is located the sun deck, with two pools each of 13 m in length, each one with two depths (children and adults, this latter has a length of 9 meters), between them are located two jacuzzis, protected by a window. The lay out is very similar to the Mistral and works very well, much better than other modern cruise ships of larger size. Forward are two pools, and aft Chez Claude Bar. This is a typical layout of lengthened ships, such as Norwegian Dream, Norwegian Wind, etc. where the solarium was enlarged, but not the pool volume, so as not to worsen the stability. Festival has used teak exclusively around the pools, and all the furnishings are plastic. But this deck lacks the sophistication the design details found in other ships, such as statuary, fountains, etc. Forward of the pools there is a bar counter under a canvas, called Bar du Palais, and an ice-cream bar. The summer itinerary of the European Vision includes two full days at sea, which means that passengers will have time to enjoy these installations, under the Mediterranean sun. Forward of the lido deck is the gymnasium and the Atlantic health centre, up the wheelhouse, designed by Syntax Group. It is divided in three sections, all accessible from the "U" shaped lobby. To starboard is the beauty salon, including the massage rooms. In the centre, behind large panoramic windows, is the gymnasium, which has exercise machines oriented toward the bow, and the aerobic zone in the interior. Also there is a relaxation zone, with a small bar, located on the port side. This area is very far from the installations offered in the gymnasium of the Costa Atlantica, nor does it have the spectacular decoration of the Millennium. I think it's functional, but never spectacular. The children's day room was found portside, managed by professional nurses. Festival looks for the family market and the ship has plenty of installations to entertain all family members, independent of their age. Aft deck 12 (Olympie), after the funnel, is located the discotheque Flamingo. Her lay out is similar to a Crows Nest of a RCI cruise ship, surrounded on three sides by picture windows, and a decoration made mainly in stainless steel and navy blue tapestry. It's larger, more spacious, and better decorated that of the Mistral (decorated in rose tones). It has an ample bar of semi circular shape, made of stainless steel. It is the only area on board with an appreciable level of vibration. Forward of the disco, on both sides, there are two spaces dedicated to children. Amidships of this deck is located the jogging track, which encircles the pools, and also serves as additional sun bathing zone. Forward of this deck the passengers find the rock-climbing wall, 7,5 meters high, which was only found in RCCL ships before the European Vision. Festival also caters for the sportsman and energetic passenger and has therefore installed a golf simulator, and a nine hole mini golf course, on deck 13, and a full size volley/basket ball court aft of the funnel, on deck 14. The sports facilities offered on board are very complete. The vertical circulation in European Vision is the best in modern cruise ships, with four main staircase and elevator towers, each one with two elevators (center and poop) and three elevators (forward). These towers travel all passenger decks (including the pool), which makes boarding easier. But the European Vision lacks some of the details of the Mistral: the passengers don't see the forward elevators from the information desk, this disorientates some passengers, the lift signalling is improved but this is a less important aspect. The European Vision is a very interesting chapter of the Festival Cruises expansion. With 165,000 passengers sailing on Festival ships, 95% of whom are Europeans, the company has a strong foothold and plans to continue growing. New ships means new markets and Festival plans to create the demand from the 300 million European source market.